Does anyone else feel like there's been a momentum building towards this mid-year point? It's a slightly crazy feeling but super exciting nonetheless. 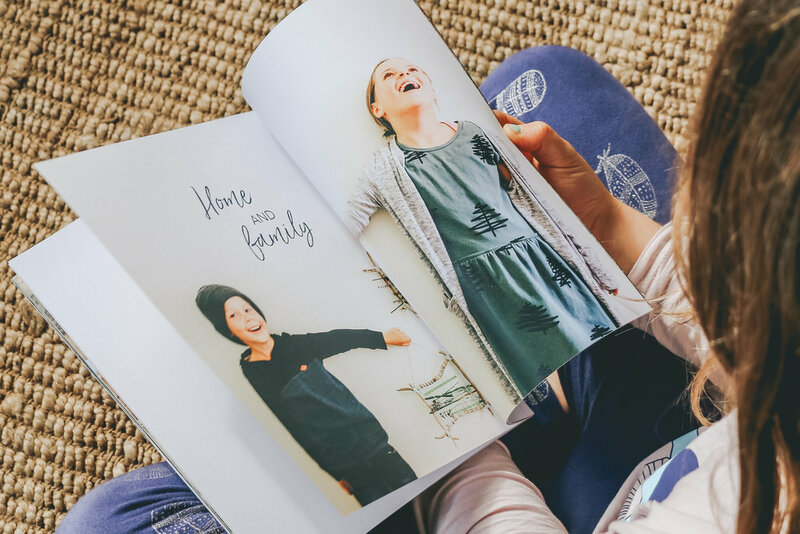 Right now I want to reach for the unreachable and take a moments pause so I can savour my joy in holding this second issue of Wild Ones mag (or my littles holding it as the case may be in these pics). I know this moment will soon be interrupted by the excitement and busyness of approaching deadlines for the next two issues, the scheduled photoshoot for my contribution in issue 3 next week, AND my attempts to tick off the ever growing list of to-dos as the departure date for our big BIG trip draws very very near. In less than 2 weeks my friends, we three will be boarding a flight and heading to Vietnam for the month of July!!!! I wish I could promise another blog post before we leave giving all the juicy details for what this trip will hold and how it has come about. But the reality is and as my kids keep reminding me, it's now just 12 sleeps away and I know that my so called 'slow gentle' life is currently a long way out the window! So regrettably, those details are not going to come about within the daily countdown that's happening around these parts. But right here right now, it's time to breathe and talk about Issue 2 : CHANGE, the theme for this current Autumn / Winter Issue of Wild Ones. Last week it was sent out to all Nature Play SA Family Members so if you are not already on board, you may wish to consider it since just like Issue 1 : BEGINNINGS, this next one is absolutely gorgeous! In keeping with that inaugural issue, CHANGE follows the same format with it's three sections and holds more of Jason's breathtaking photography, plus another lifecycle pullout featuring his detailed watercolour illustrations. That photo above shows the Fly Agaric fungi (or we 3 call it the Fairy Mushroom) and offers you a sneaky peek of just how beautiful and biologically accurate those illustrations truly are. There are two lifecycle pullouts with each issue and just wait until you see how intricate Jason's illustrations for the Rain Moth are! That guy doesn't do things by halves and consults with every expert he can think of (including those in specialised fields for the South Australian Museum) to make sure colours, tones, shape, form, markings, every teeny tiny aspect, is absolutely as it should be. And if it's not, he will scrap it and redo. That's how committed and passionate he is in educating and sharing knowledge with children and their families. Other pages sport insightful tips on fruit trees from Nature Play's ambassador, Sophie Thompson and a truly heartwarming opening story from Claire Lock which reads as pure as poetry and not only bought tears to my eyes, but a firm lump in my throat. Then there's the 'Home and Family' section, with more delightful tutorials to share with your children including one from me on Lavender Sachets. FYI: yes that is a mass of dreadlocks in my kids hair! I took these photos yesterday and last night after bath time, I dealt with the dreads!! The other exciting bit is that with the release of this second issue, the first one will soon be available in the Nature Play shop for separate purchase so you will be able to get your hands on it even without being a member. The same cycle will follow with all future issues... once the newest has been released, the previous will become available in the shop. But given it's a bi-annual publication, the 6 month wait is loooong! Before I sign out and get cracking on all that is to be done before take-off, can I just mention (again) about the packaging. I've raved about this on Instagram and will pretty much continue to do so to anyone who stands still long enough to listen but each and every magazine is wrapped up as a gift. And I'm talking every single part of that wrapping is natural, recyclable, compostable and jolly darn gorgeous. Even the postage envelope is padded with that shedded pulpy paper stuff. 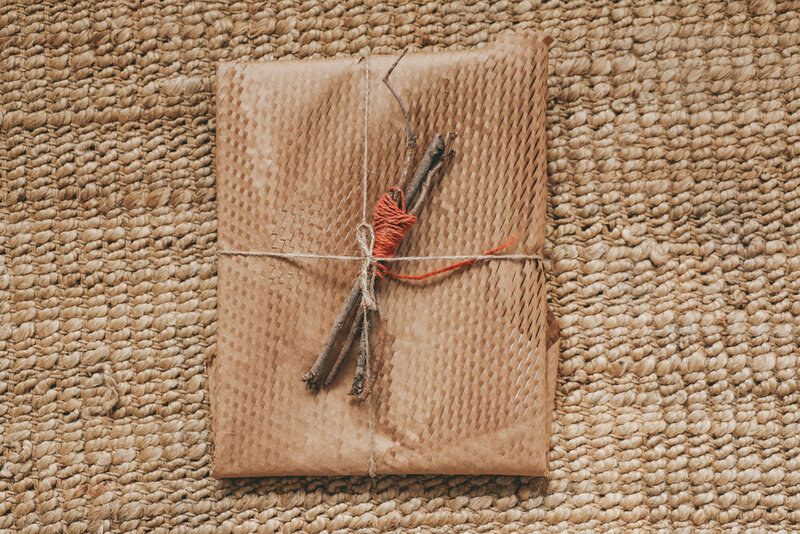 But when you retrieve your 'gift' from within that envelope, you are greeted with a parcel that is bound in a single piece of tissue overlaid with a sheet of craft paper bubblewrap, all tied together with twine. What sets each issue apart, making them unique unto themselves is the offering from nature that embellishes your 'gift'. 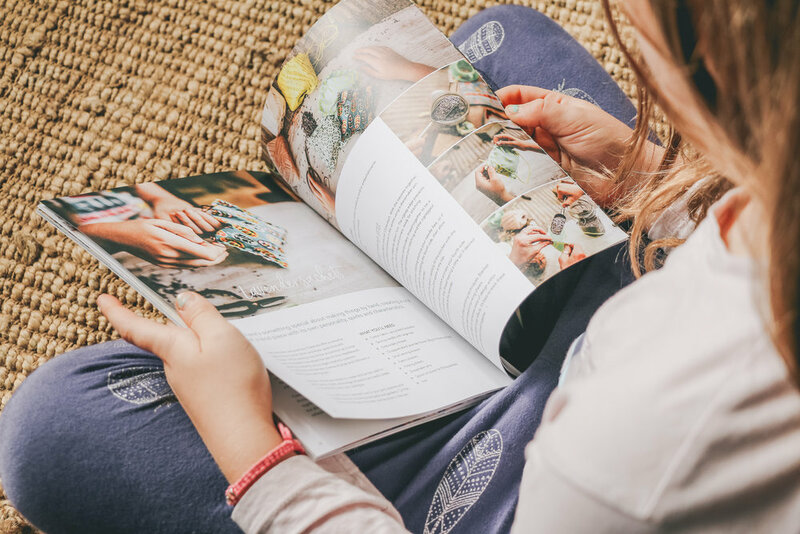 Issue one held a sprig of lavender to compliment the lavender playdough tutorial included within the pages, and this issue holds a bundle of sticks because within it's pages is a tutorial from Claire Lock for Nature Weaving. The sticks are bundled together with yarn and let me tell you folks, that yarn is not just any yarn! That is Wild Mushroom from Shilasdair's Highland Inspirations Range; 10% cashmere, 10% baby camel, 40% angora and 40% merino. All spun together and naturally hand dyed with madder root, onion skins and tansy to create the evocative tones of the wild fungi in the woods around Dunvegan Castle in the northwest Skye*. I lovingly donated part of a skein from my stash knowing the colour-way was perfect for Autumn / Winter and bound with the sticks, it became an undeniable compliment to the autumnal tones on this issue's cover. Enjoy friends and I'll see you on the flip side with all the stories from our adventure! * quoted from the yarn label but Dunvegan Castle (in the northwest Isle of Skye) is located off the west coast of Scotland. Nope, I haven't yet travelled there but instead bought the yarn from one of my pilgrimages to The Craft Sessions.